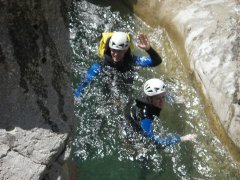 Canyoning : travelling through canyons using a variety of techniques that may include walking, scrambling, climbing, jumping, abseiling and swimming. 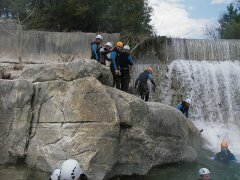 Your guide will explain how to use the technical materiel as well as the the way to progress in this fragile natural environment. 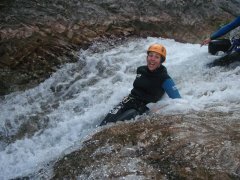 Bring your picnic for the full day trips, large bottle of water, short, tshirt, swimsuit and for photos a waterproof camera. 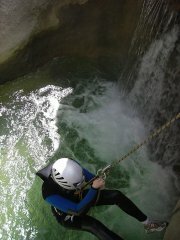 The material for the activity is supplied (wetsuit, helmet, harness, socks, professional shoes, rucksack,). 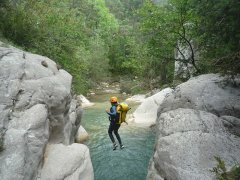 A dip in another universe... A 30 minute walk along the trail of the Bastidon overlooking the gorges to arrive in a enchanting canyon where ferns, boxwood trees, abseils on cascades of Tuff bring us to the top of a cliff face 100 m above the Verdon after the descent by abseil, we continue by swimming and hiking down the river to walk back up at the Col de l'Olivier. 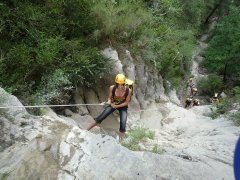 Long abseils to the Verdon... A 20 minute walk on the trail of the Bastidon gives access to Cabrielle (cabré means goat in Provençal), which takes us to the beginning of the canyon where long abseils follow one another, to plunge us into the heart of the Verdon. 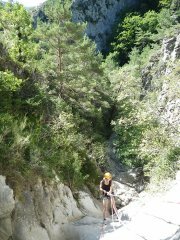 We continue by swimming and hiking down the river and walk back up at the Col de l'Olivier. 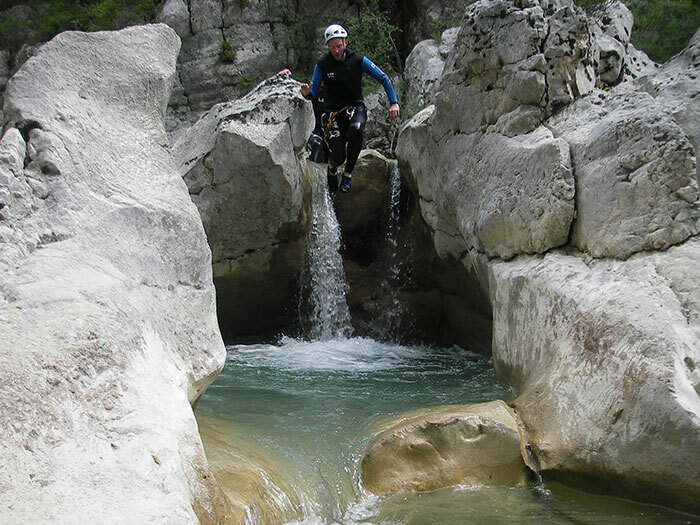 The dizzying access... A succession of abseils and shady corridors, takes you into this mineral setting until the last abseil, that plunges you in the sunshine into the Emerald water of the Verdon. 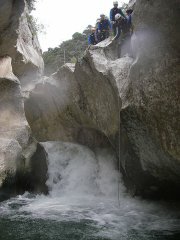 We continue by an aquatic hike going up the River to the "Maugue", passing through the underground river of the Imbut. 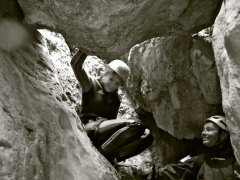 From there an ascent of half an hour will allow us to rejoin civilization. 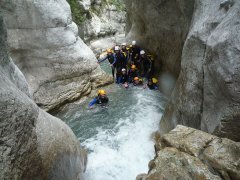 Great for discovering the canyoning and the richness of this natural environment. 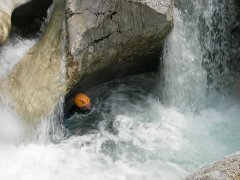 Natural Slides, small abseils, small jumps are all possible. 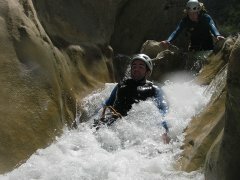 A relaxing day to share with family or friends. 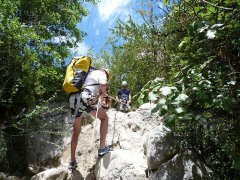 A mythical journey... A ¾ hour walk takes you up from Moustiers sainte Marie to the plateau overlooking the surrounding area. 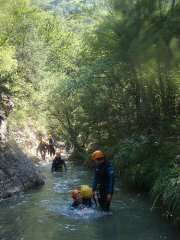 From there, you will discover the canyon of Riou by it's aquatic part where jumps, slides and climbing will transport you in a mineral environment. 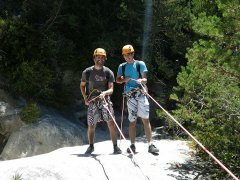 The second vertical part allows you discover the joys of abseiling in cascades where the sky and water blend as one. 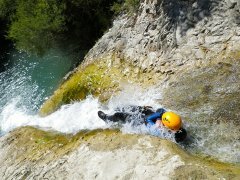 From the Point Sublime, discover the entrance of the Grand Canyon, descending by a "spider abseil" to arrive in the Couloir Samson where you will float down the current with several jumps possible and discover the rock formation worn away year after year. 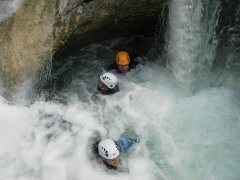 The Valley of anxiety... 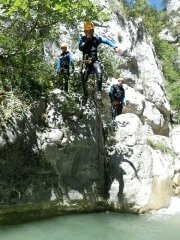 This is a superb walk that leads us to this canyon that only can be done in spring, when the water level allows it. 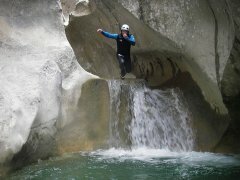 It is a true pearl of freshness where many jumps and abseils take us along to discover the semi underground grotto of the PEAR and a stunning resurgence with its age-old tuffs. 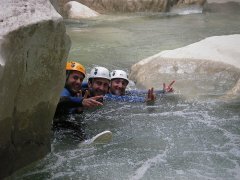 A Pearl in the Valley of the Estéron, canyon aquatic and fun... an unforgettable day in a world where water and the rock have created a unique playground.